Hemcheck’s hemolysis detection test for blood gas syringes has obtained a CE-mark. The CE-mark is a certification of compliance to health and safety standards that must be obtained before the product can be sold to hospitals, GPs and other health facilities in Sweden and Europe. – It is with great pride and pleasure that I announce that we have CE-marked our product according to plan. Our collaboration partners, SHL Group and Scanfil, have prepared a production scale up, and, as we have previously mentioned, we have already begun cultivating the market. We have also strengthened our organization pending a market launch, by recruiting a Head of Marketing and Sales, says Hemcheck’s CEO Annelie Brolinson. The CE-mark is the end result of a long chain of processes involving user demands, documentation, technical and regulatory requirements, safety requirements, user tests, and validation of the production process, which are examined as a whole, and when successful culminate in a CE-mark. 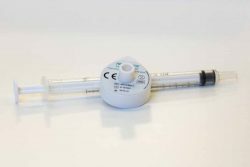 – CE-marking the test for blood gas syringes has actually proceeded faster than originally planned, as we have been able to make use of the development work done for our original product, the hemolysis detection test for regular blood collection tubes. That product is currently in the validation phase of the CE-marking process, says Annelie Brolinson.